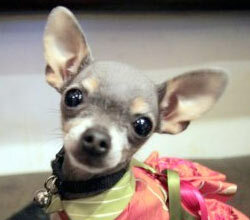 Chihuahuas on the Huff Post’s Adorable Or Ugly pets photo gallery?!?!?! So the Huff Post had the audacity to include this noble breed in an “Adorable Or Ugly? Controversial Pets And Wild Animals” photo gallery a few days ago. Hrmph! How dare they?!?!?!?! There need be no pondering on this issue! 1. Chihuahuas are Number 2 on the list?!?!?!?! I am no second banana, ever! 2. “Faithful, adorable companion” OR “the quivering sidekick“?!?!?!?! I do not “quiver.” I have a unique method of maintaining body temperature. Self sufficient and very green, if you ask me! 3. And a mere “sidekick”?!?!?!?! I AM The Princess, I’ll have you know! 4. Ahhhh … “sidekick of obnoxious blonds everywhere”?!?!?!?! Whatcha talking about? Don’t you mess with my Mama!! Those artfully conceived highlights or hers are haute coifure, Amigo! 5. And lastly, but not least, to be included among a pangolin (whatever the heck that is), mole rats and God forbid, a Sphynx cat?!?!?!?! Chicos, the way I see it, this means war!!!!! Obviously they tried to get away with this outrage while Mom was out of town and I could not post my vehement objections. But let it be known to all those responsible that they have now incurred the wrath of one ticked-off Chihuahua Princess! Beware, I have muchos cousins, Amigos. Your ankles are now fair game! Terror alert, POSTED! Penguins chasing a butterfly spotted on Huff post. Heh, heh! Go butterfly!!! See, it doesn’t take much to find some good quality family fun to share with your humans. Grab your laptops, some snacks (I won’t recommend popcorn because it get’s stuck in between my tiny teeth) and enjoy the love! You are currently browsing entries tagged with Huffington Post at Chihuahua Wisdom Blog.